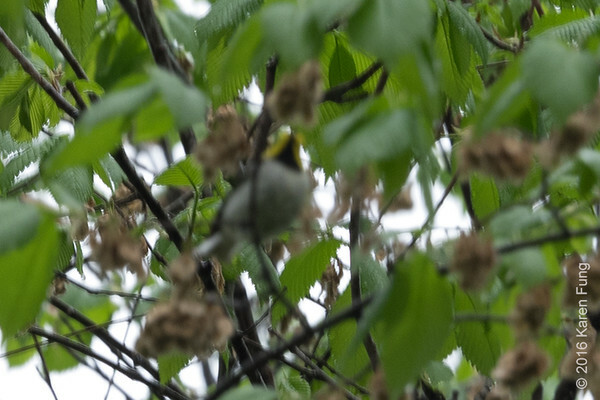 Photographed in Central Park (New York, NY) on 1 May 2016. Observed by Alexis Lamek, Anthony Collerton, and myself during a steady drizzle. 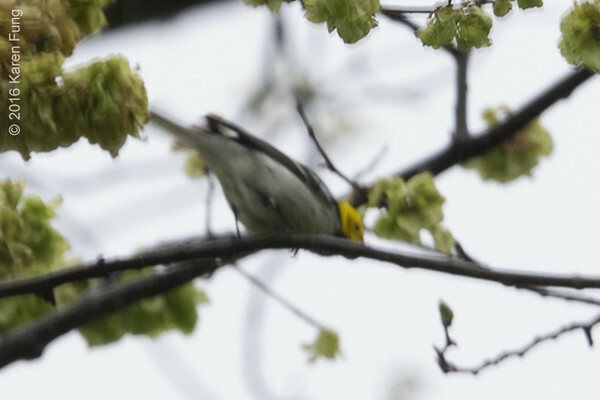 Kudos to Alexis for immediately recognizing that this bird was not a typical adult male Black-throated Green Warbler (the expected species in NY) but possibly one of the western species from this complex that includes Hermit, Townsend's and Golden-cheeked Warbler. 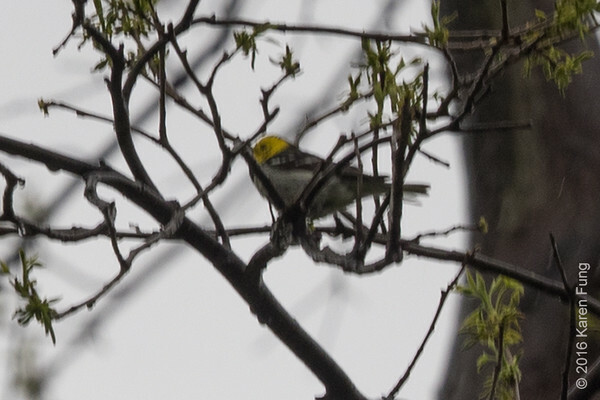 The bird was feeding high in trees over Triplet's Bridge and near the 77th St/CPW exit, sometimes in the company of a few Yellow-rumped Warblers. It occasionally sang a song that resembled Black-throated Green, but we are not sure if it had other vocalizations. The Yellow-rumps (Myrtles) were also singing. The images were captured in Raw mode and RGB colorspace , with white balance set to Auto. They were converted to sRGB prior to saving as JPEGs. 1) the ISO was set to 100, so the shutter speed of the majority of my shots was 1/100s! Oops. This is the main reason the images are so blurry. 2) the time stamp was still set to EST, not EDT, so all the recorded times were one hour too early. NB: This bird was was not reported by anyone after the initial sighting. Hopefully it will be refound so that others can supply better photographs and some audio recordings. 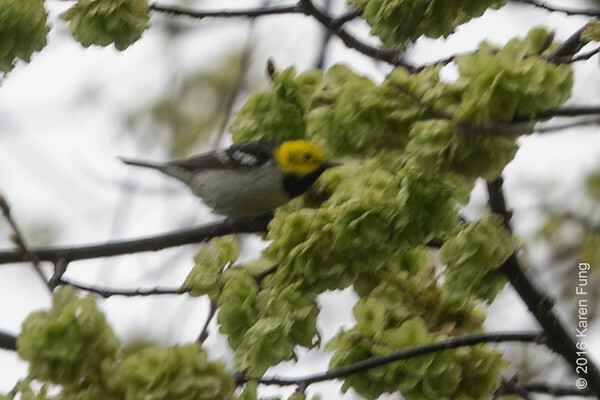 When I posted the original report to online forums with pics, I called it a "mystery warbler" and addressed the possibility that it was a hybrid. Subsequently there were many discussions about it on- and off-line. 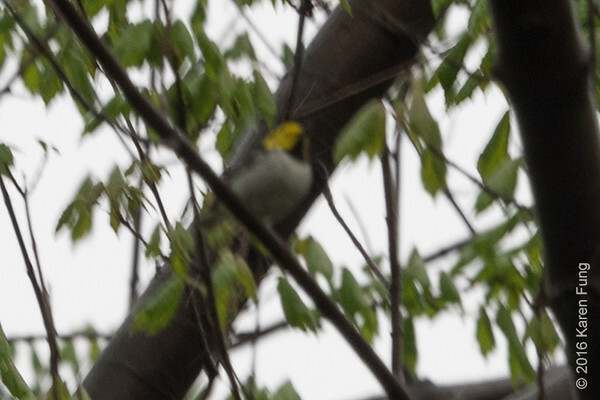 Will leave it to the experts to decide, but the general consensus so far is that it is a 'Hermit Warbler', i.e., either a pure Hermit , or a mostly pure one. The sighting was reviewed and accepted by the eBird reviewer. Side View showing a dusky auricular on a yellow face, and almost no streaking on flanks. Underparts are white, with no hint of yellow in the vent. The upperparts (back and nape) are dark. Wings are dark, with two white wing bars. The black throat is in the shape of a small, neat triangle with clean margins., which is typical of an adult male. View from below. Neat black triangle on throat (less black than on a male Black-throated Green). White underparts and no streaking. White outer tail feathers. From this angle, the face looks almost uniformly yellow and the underparts uniformly white, though the image is blurry. Another side view that shows a yellow eye-ring and dusky auricular. Wings are dark, with two white wing bars. Nape is dark and tapers to a thin line going up the back of the head. Underparts look mostly white, and plumage looks wet.. The bird was backlit and some global photo exposure adjustments were made post-processing.